Anchors enable you to link content within a web page, an email or a newsletter. For example, you may want to add anchors at the beginning of each section of a long web page with many sections. In addition, you can create an index on top of that page that will link to all those anchors. This will enable readers to go directly to the content of their interest without having to scroll down until they find that content. Go to the web page, blog or email to which you want to add an anchor. Place the cursor in the section of the text edition that you want to link. Click on the "Anchor" icon (next to the Link/Unlink icons). 6. Enter a name and 'OK'. 8. 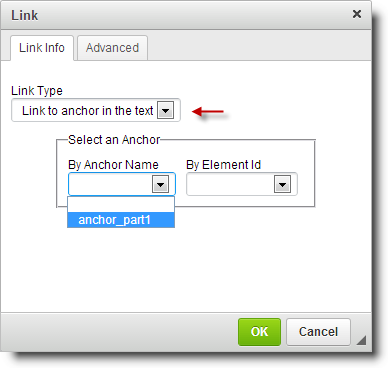 Select "Link to anchor in the text" in the "Link Type" drop down and then select your anchor. Note: A common mistake is trying to link an anchor that doesn't exist. Remember: first create the anchor and then the link to it; otherwise, its name will not appear in the list of available anchors. Want to link/point to an anchor on another web page? You need to link to the page and at the end add a Hashtag (#) with the name of the anchor. 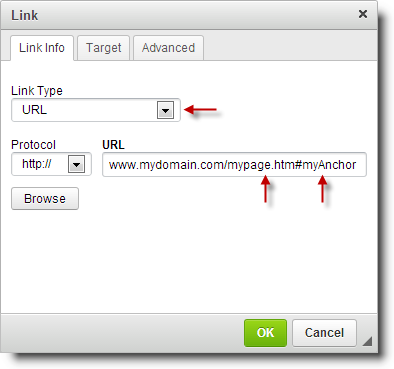 For example, if the page http://www.mydomain.com/mypage.htm has an anchor titled myAnchor linking directly to it, the link will then read: http://www.mydomain.com/mypage.htm#myAnchor.